For any serious athlete, an Olympic gold medal is the ultimate prize. And so every four years, thousands of sportsmen and women from around the globe gather at the Olympics with the ambition to reach the highest podium on the world's biggest sporting stage. The athletes' desire to win combined with the rich history of the Olympics always produces a spectacle. The fastest 400m by Lee evans and the giant leap of Bob Beamon who got annoyed at almost missing out on the long jump finals that he nearly jumped out of the pit 8.90metres, then he bounced like a kangaroo. Carl Lewis couldn't match it. My memories are filled with that and the black power salute by Smith and John Carlos. Linford Christie getting his first Olympic medal - Bronze - then Silver when Ben Johnson was found guilty of taking a banned substance. Atlanta. There had been so much hype about who would be lighting the Olympic torch but Muhammed Ali's name was never part of the discussion. When the torch-bearer got to the top of the steps, and the spotlight hit Ali for the first time, I just sobbed at the poetry and magic of the moment. 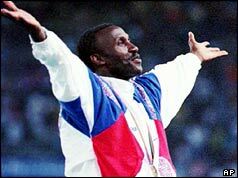 I will never forget the 1996 Olympics where Donovan Bailey set a new record for the men's 100m - 9.84 seconds. The look of strain and pure ecstasy as he crossed the finish line was truly a "Kodak moment". He went on to lead the Canadian men's 4x100m relay team to gold a few days later. Of all Olympic memories, the one that stands out for me is the clenched fist protest by the black american athletes in the Mexico olympics. I am not black, and I am British, but it summed up at the time what I felt about the civil rights situation in America and watching it I felt a surge of empathy with it. I felt part of that expression of the injustice being done to the black community there. Your article on the web site brought it all back. Those who criticised it forgot that there are things in this world more important than sport. Wilma Rudolph from the USA made an unforgettable impact upon me and my friends which I have never forgotten and I used to discuss her brilliant performances with my friends. She used to leave the opposition standing. I have seen great runners and performances but none so good that would ever hold a candle in my mind to Wilma Rudolph's superlative running in the 1960 Rome Olympics. I believe that her record of three gold medals in one Olympics and in these events has never been equalled or beaten by any female American or other runner since that time. The only other female to have beaten that record would obviously be the great Mrs Fanny Blankers Koen in the 1948 London Olympics. But perhaps I'm wrong! Wilma was GREAT! Every time the Olympics are shown, I can always see Lillian Board. My best memory of her was in the 1968 Womens AAA Championship when she was just beaten by Vera Nikolic who broke the world record on that occasion. I was 15 years old, the noise at Crystal Palace was awesome and it will stay with me forever. Lillian Board would undoubtedly have gone on to be an immense athlete. David Memery's 400m Hurdles Gold Medal in Mexico, 1968 and David Coleman's fantastic commentary on the race - surely a forerunner for the type of commentating displayed by Steve Cram during Kelly Holmes' victory in the 800m in Athens 2004. It can only be Seb Coe returning from illness to take bronze in the 800m in 1984 and retaining his 1500m title. I suspect he might swap a 1500 gold for an 800 gold though! Second to that was my countryman John Treacy claiming silver in the marathon in the same year. The greatest heartbreak of that year must have been for Steve Ovett. 1984 Olympics - Daley Thompson. Decathlon. 8847 points. A world record that would stand for NINE years. Enough said. I was ten years old watching Vera Caslavska's amazing gymnastics performance in 1968. Her immense joy at her achievement - and her silent protest at the Soviet invasion of her homeland - left a lasting impression I will never forget!